Catalina Custom had the privilege of doing the seating for a custom show bike. 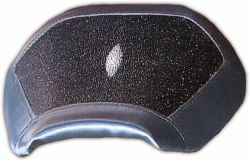 The seat had black Sting Ray material for the inserts and utilized a gray simulated brushed aluminum vinyl for the trim. Above shows different phases of the upholstery project. 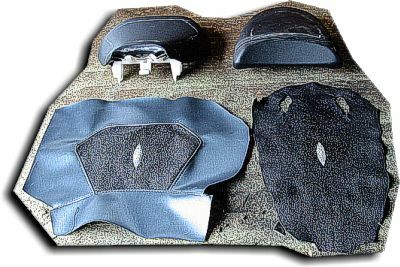 One seat is in original shape and one seat has the design layed out on it. Also shown is the vinyl sewn onto the Sting Ray hide ready to fit, sew and install. 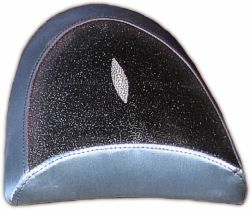 A raw uncut Sting Ray hide is also shown. 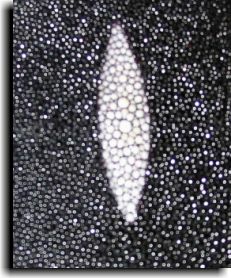 Above is a close-up of the center of the Sting Ray hide.